Chelsea Wolfe is being haunted. Sometimes, in the middle of the night, she'll see a shadowy figure in her room rushing towards her. The cause behind these dreaded nights is biological rather than supernatural. Wolfe suffers from sleep paralysis, a medical condition where one wakes up but can't move, with the feeling of an overbearing weight crushing her. This paralysis can result in hallucinations, such as the shadowy figure Wolfe's mind manifests. 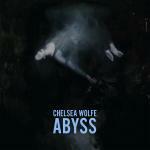 Wolfe took this abstract, suffocating sense of terror and channeled it into her fifth album, Abyss. A sense of dread and overwhelming density covers the entirety of the record, like you're sinking in quicksand. Carrion Flowers has a quaking, mechanical menace with vibrations strong enough to blow out speakers. At the center of this maelstrom is Wolfe, whose voice is quiet but agitated, the right mix of tension and calm. Many of the album's best songs focus on her sleep paralysis, creating a lyrical and musical cohesion where each element reinforces the others. On Iron Moon, a doom metal vibe picks up and drops away, leaving you with Wolfe's whisper, gentle plucks and lines like "I go to him in paths of dreams/In bed awake with shadow beings/They crawl inside and wait with me." Dragged Out opens with fragile, despondent screams of ghosts. Or maybe it's the sound in Wolfe's head when she wakes up and can't move. In either case, the voices are reaching out and dragging Wolfe "out in the madness" and "out in your loneliness." Not all songs take place during Wolfe's sleep paralysis, though. Some numbers, like Grey Days, look back once she fully wakes up and recovers. "How many years have I been sleeping?/How many hours did I throw away?," she asks, sounding angry and desperate. Grey Days is also a change of pace musically, the first song on the album that brings some rhythm out of its percussion. Fuzzed-out guitar and creaky violin strings add a sinister, but lively feel. After the Fall similarly reflects Wolfe's struggle to regain control over her body. Percussion like muffled gunfire pummels underneath squirming synthesizer lines, as Wolfe spends the chorus shouting at herself to wake up and to not "let them win." Musically, Wolfe has gotten better at turning songs inside out and defying expectations. On Crazy Love, she takes an acoustic love song and turn the concept into an unearthly horror anthem, completely with ghastly moans and dangerously obsessive lyrics. Unfortunately, these innovations don't last. The last third of the album runs into the same problem as Pain Is Beauty. It starts to lose the plot and the songs become repetitive or simply uninteresting. They go over territory already covered at the start, without bringing anything new or better than what came before. Despite the weak ending, Wolfe brings a chaotic, engulfing sound that makes this one of her heaviest works yet. Taking her medical condition and turning it into songs gives her far more investment and catharsis than she ever has before. She may still live with sleep paralysis, but on Abyss, Wolfe has never sounded more awake.